The Beverly Hills Sign at the corner of Wilshire Blvd. & San Vicente Blvd. is located at the entrance to Beverly Grove. Beverly Grove is an upscale neighborhood within the Beverly-Fairfax neighborhood in the Mid-City West area of Los Angeles, California. 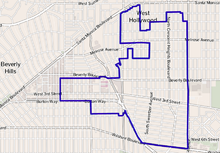 Beverly Grove is located in the Wilshire Community Plan area and is generally bounded by Colgate Avenue on the north, Fairfax Avenue on the east, Lindenhurst Avenue on the south, and San Vicente Boulevard on the west. In the Los Angeles Times Mapping L.A. project, Beverly Grove is mapped as bounded on the north and west by the West Hollywood and Beverly Hills city limits, on the east by Fairfax Avenue and on the south by Wilshire Boulevard and San Vicente Boulevard. It abuts the city limits of Beverly Hills to the west, West Hollywood to the north, Fairfax and Mid-Wilshire to the east, and Carthay to the south. There is one private elementary school. It is home to shopping and fashion districts, Cedars-Sinai Medical Center, the Four Seasons Hotel Los Angeles at Beverly Hills, Sofitel Los Angeles, SLS Hotel at Beverly Hills, the eight-story Beverly Center, and the Robertson Blvd. retail district. In the first draft of Mapping L.A., "Beverly Grove" was not included as a distinct neighborhood; rather, the area was shown as part of the Fairfax District. Zip codes are 90046 and 90048. The 2000 U.S. census counted 21,417 residents in the 1.65-square-mile neighborhood—an average of 12,990 people per square mile, fairly normal for Los Angeles. In 2008, the city estimated that the population had increased to 22,855. The median age for residents was 38, old for both the city and the county. The percentage of white people living in the area was 82%. Other ethnicities in 2000 were Latinos, 6%; Asians, 5,1%; blacks, 2%; and others, 4.9%. Iran (20.2%) and Poland (7.4%) were the most common places of birth for the 36.3% of the residents who were born abroad, a figure that was considered average for the city as a whole. The median household income in 2008 dollars was $63,039. The average household size of 1.7 people was low for Los Angeles. Renters occupied 74.8% of the housing units, and house or apartment owners the rest. The percentages of never-married men and women, 53.2% and 40.5%, respectively, were among the county's highest. Exactly half of Beverly Grove residents aged 25 and older possessed a four-year degree in 2000, a high rate for both the city and the county. The percentage of residents with a master's degree was also high. Perutz Etz Jacob Hebrew Academy, a private elementary school at 7951 Beverly Boulevard, was the only school operating in the neighborhood. The Four Seasons Hotel Los Angeles at Beverly Hills is located at 333 S. Doheny Drive in Beverly Grove. The neighborhood is home to shopping and retail districts, the Beverly Center, the Four Seasons Hotel Los Angeles at Beverly Hills, SLS Hotel at Beverly Hills, the Sofitel Los Angeles, and 8500 Burton. The Beverly Center, which was opened in 1982 by developers A. Alfred Taubman, Sheldon Gordon and E. Phillip Lyon, features various designer stores and restaurants. The site's former occupant was a small amusement park known as Beverly Park. This page was last edited on 15 November 2018, at 05:58 (UTC).